The FRIDGE® – Friction Grip Bridge System was introduced by Implanova® as a revolutionary technique for creating a totally implant supported prosthesis that is fixed for the patient but removable by the dentist. This system serves as a superior alternative to traditional fixed screw-retained process and eliminates the need for screws, cement, implant level impressions, jig verification, metal bar, or other components that create a hassle for the practitioner. The system also allows the practitioner to conveniently examine and clean the prosthesis and implants without having to spend hours of opening access holes and unscrewing screws to remove the prosthesis. 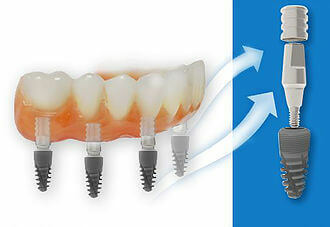 Therefore, the FRIDGE® system would considerably reduce the labor and expense involved with creating and maintaining implant-supported fixed dentures. FRIDGE® system works by virtue of stock, precision-machined titanium FRIDGE® caps that engage with the abutment head when fully seated by way of friction, allowing it to sit tightly on the abutment and serve as a stable pick-up attachment for the prosthesis. When tapped in and fully seated, these FRIDGE® caps would not be removable without the use of significant force. These FRIDGE® caps are compatible with all Unibutments and select stock abutments. The design of the caps can correct up to 8 degrees of inherent non-parallelism when using straight Unibutments, and up to 20 degrees of non-parallelism when using angled Unibutments. As a result, your implants don’t need to be perfectly straight to use this system! Silicone washers and Delrin caps are also available for easy processing.